You’ve struck gold! This coupon allows you to Buy one round of miniature golf and get one free at Miner Mike’s Adventure Golf. Print and present coupon at time of purchase to redeem this offer. 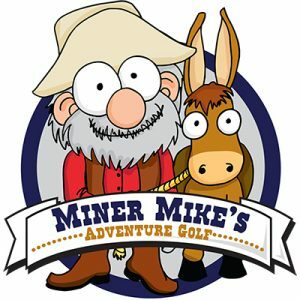 Visit Miner Mike’s Adventure Golf for outdoor fun May 4 to Sept. 29. The 18-hole course features a water wheel, logs, rocks and a mining car. Course contours provide mini golf challenges for players of all ages and abilities. Affordable birthday party packages and group rentals are also available! Dress in your best Hawaiian apparel. Everyone gets a free lei with paid round. Show off your favorite super hero. Everyone receives a free super hero mask with paid round. Get into the New Orleans spirit! Everyone receives a set of beads with a paid round. Active Adult Mondays: One active adult (ages 55+) is free with a paying round. Two-for-Tuesdays: Two play for the price of one! Visit their website For more rates, hours and information, or call 630.960.7500.